In an extensive interview with the Business of Fashion, longtime Allure magazine editor Linda Wells reflects a bit on her success with the fashion and beauty publication she's helmed since it was started in 1991, the one that most recently made headlines for putting actress Zoë Saldana's weight on its cover. Wells is very serious about making it clear that the choices her staff makes for their annual Best of Beauty Awards aren't influenced by the magazine's advertising department, though that doesn't mean they haven't had issues in the past with advertisers becoming displeased with negative reviews of products. 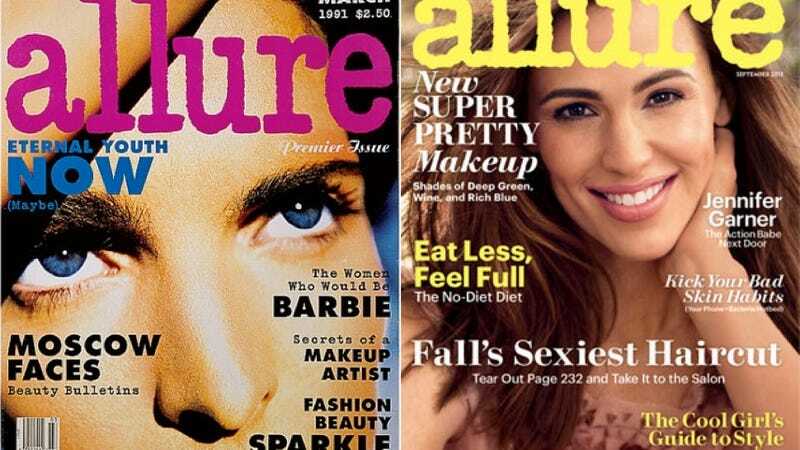 Allure realized quickly, like Lucky, Vogue and others, that the way to make money is to integrate the fact that you are telling readers to buy things by essentially selling things to those same readers. "A no-makeup trend could come along and that would be the end," says Roberta Garfinkle, director of print media for advertising giant McCann Erickson. That last bit is true: Betty Friedan reviewed a book about the state of women in a world that was post-her, reportedly writing, "The better [women] are able to feel about ourselves as people, the more we are able to enjoy being women, the more beautiful we feel and look, and the more we can take delight in...celebrating ourselves." Friedan also argued that the book and the "controversy it is eliciting could be a hopeful sign of a new surge of feminist consciousness." Even though I wore hardly any makeup, I always loved Allure as a teen. The magazine got the best photographers, had a great layout and wasn't unapproachable like Vogue seemed to be much of the time. I have boxes of old Allure's sitting around that I can't bear to throw out, despite the fact that I eventually stopped subscribing to the magazine because I realized after awhile that yes, most of it was the the same thing, and often contradictory content at that. But that's the deal with women's magazines: they are wholly contradictory, able to claim editorial independence while profiting off of the very products they say they're not shilling, able to post in-depth reviews of serious feminist tomes that criticize the very work they do. Wells deserves enormous props for her success in an incredibly competitive industry but let's not pretend that in order to do her job, she has to purposely remain naive about its influence and choices. But is it naivete if you know you're doing it? According to Wells herself, we should just "Enjoy the delusion; embrace the denial." That's her philosophy and the philosophy of her entire industry to boot.